Got my new car Sarurday Nov. 26, sad to see my Maxima go, it was a great car, but hope to be happy with my 2006 A3, brilliant red, dsg, premium package. Also came close to getting a G35 Infiniti, faster car, but the handling wasn't as good, and the salesperson, well I'll say no more. Anyway, I'm from Nova Scotia, Canada, and I'll probably have the only A3 in my town. Thats a good thing. All for now, but I'll certainly be lurking aroung these forums. Congrats on the new ride. Been real impressed with the look of that car. I came from a G35 to an Audi. You made the right choice the Japanese can build great cars but the have no souls, never will. Anyone know why the pic isn't showing. Help please. 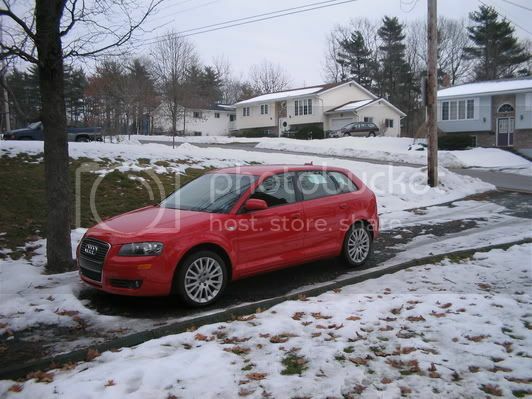 and not &lt;img src="http://i4.photobucket.com/albums/y121/baker32/audi1.jpg" alt="